Not even eye black could make those glasses look tough. Oh, the celebrities of today -- they just don't know their roles. 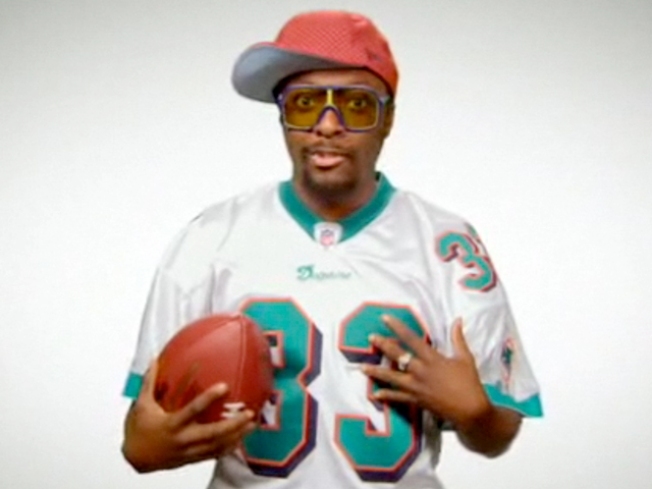 Just as we've finally stopped laughing at Master P's attempt to join the NBA and Lance Bass' short career as a Russian astronaut, along comes a timely video plea from hip-popper will.i.am of the Black Eyed Peas, begging owner Stephen Ross to receive a tryout for the Dolphins as a punt return specialist. is it to late to do it now...??? Well, he's clearly not going to make ESPN via the Scripps National Spelling Bee, so we suppose a bid to join the Dolphins is the next logical step. Will.i.am hasn't played football since high school and is now 34 years old, which means he's either over-inflated by the yes of celebrity, or -- run for your lives, the call is coming from inside the house! -- that old attention-grabbing hobgoblin in the owner's box has gotten craftier and we're about to be viral-marketed out of our minds. Knowing both Ross and i.am, it's probably the latter. Expect a Major Announcement by Tuesday, with a staged tryout for the cameras, a chef-attended carving station, a warbling wax statue called Fergie, and the announcement of a tailgating performance schedule to follow. Not pictured: thousands of disgusted Dolphins fans. Janie Campbell is a big fan of sending will.i.am into oncoming, 250-pound traffic -- for the sake of her radio. Her work has appeared in irreverent sports sites around the Internet.